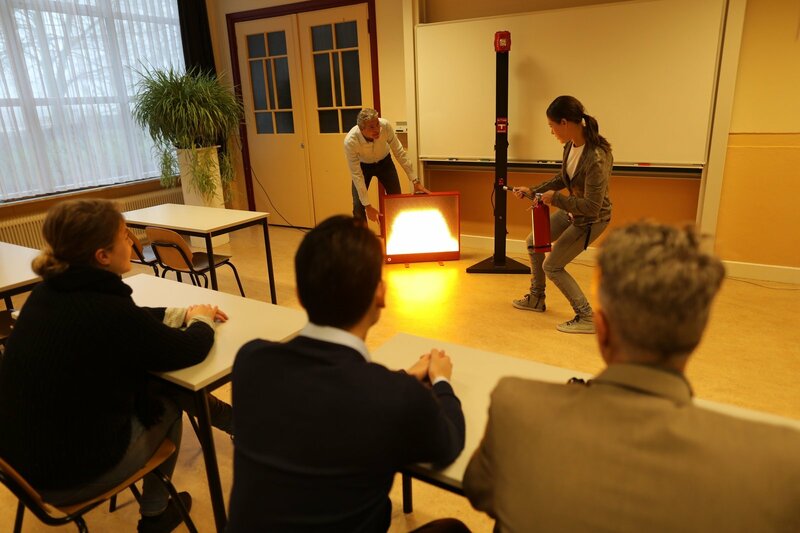 The BullsEye digital fire extinguisher trainer allows you to conduct training in any setting that fires actually occur - an office building, school, hospital and more. Conduct training in any setting that fires actually occur - an office building, school, hospital and more. Don't depend on a dry-chemical or CO2 extinguisher, this system leaves no mess to clean up. Flames respond like a real fire for heightened intensity. Create the ultimate training scenario by connecting to a smoke generator, electric cut-off prop, and RACE Station. The BullsEye system can sense the location of the trainee, as well as whether the trainee has properly aimed the extinguisher and is properly sweeping the nozzle of the extinguisher. Depending on the class of fire and level of difficulty selected by the instructor, the flames will grow, diminish and respond as the trainee attempts to extinguish the simulated fire. 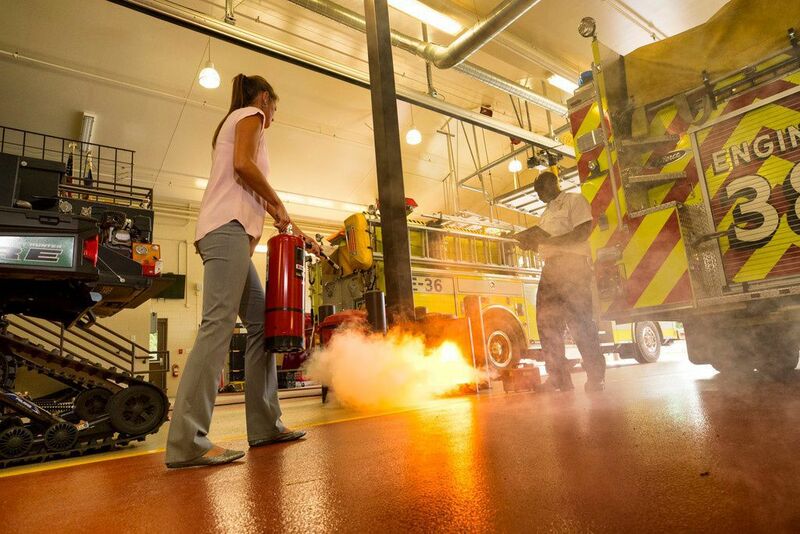 Trainees can fight the digital fire using either a laser-driven infrared extinguisher or a pressurized air and water SmartExtinguisher. To successfully extinguish the fire, the trainee must sweep the extinguisher across the base of the fire. If the trainee aims just below or just above the base, the flames will diminish, but will not be extinguished. 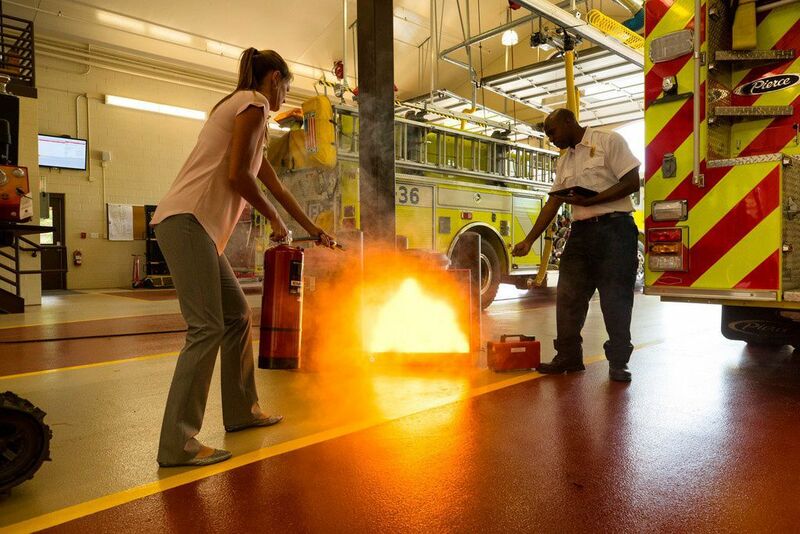 LED-driven digital flames and a laser training extinguisher provide a dynamic and realistic simulation for trainees while eliminating the hazards associated with conventional fire extinguisher training and making it easy to perform multiple trainings. Uses a conical laser to replicate extinguisher discharge, rather than depending on a dry-chemical or CO2 extinguisher, making it a cleaner way to train. 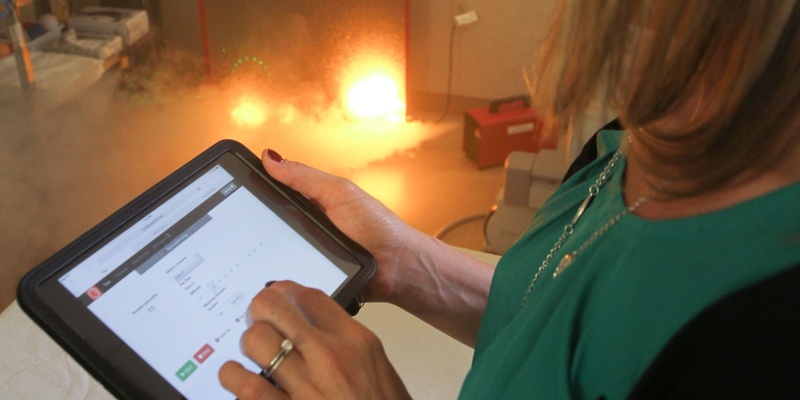 Because only a laser is emitted from the training extinguisher, extinguisher training can now be conducted virtually anywhere indoors or out – where fires may actually occur. 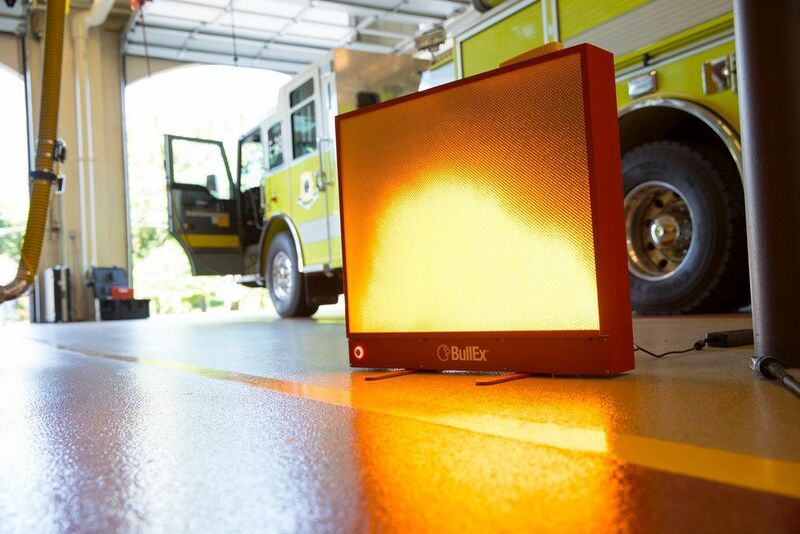 The laser-driven extinguisher simulates the behavior of an extinguisher. A variety of extinguisher types and sizes are available. Roster management allows instructors to keep track of trainees and their performance over time. 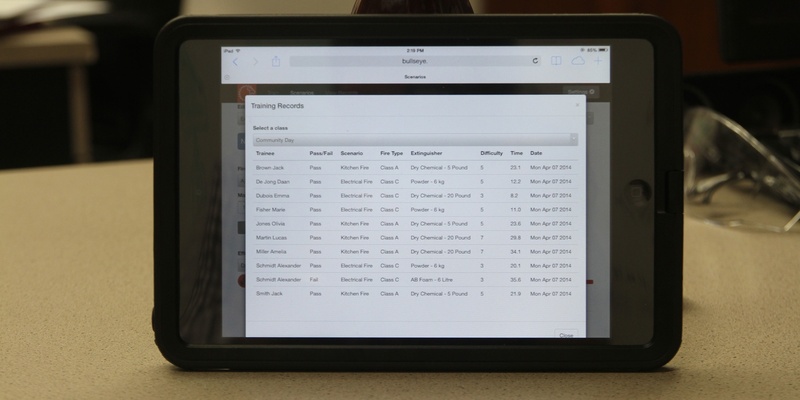 Track training details and export them to a USB for sharing, record keeping and printing certificates of completion. 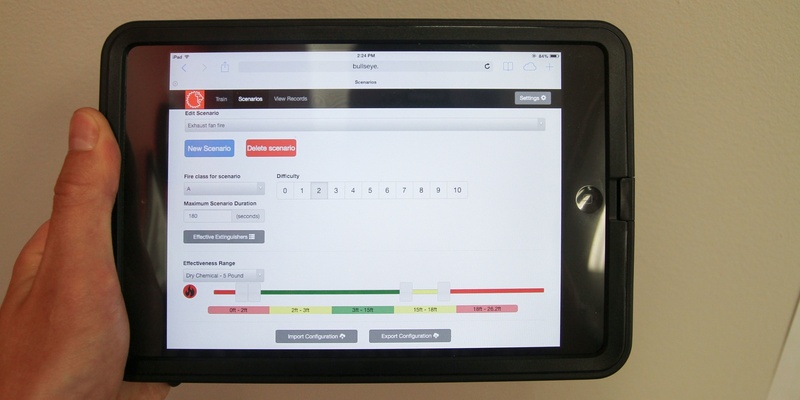 With the optional tablet control, instructors can specify fire class, difficulty and time limit. Flare up or add smoke to the evolution. This iPad is equipped with a protective case. Scenario customization allows instructors to create scenarios and save them for future use. Additionally, instructors can customize the effective distance of an extinguisher, which extinguisher(s) can be used to put the fire out and how much time a trainee has to extinguish the flames. Industrial-grade, high-impact plastic transport case to transport BullsEye unit to various training sites.